Three YouTube channels is a bit excessive, I get that. And in my defense they are all very different. I'm more hoping to prove with this post that you can definitely start and maintain a YouTube channel if you've been thinking about it. Trust me, you can so do it. Honestly a huge reason why I can keep up with my Microscope Beauty channel, our vlog channel, and the Oh, Hello Stationery channel is because they're so different. Together they cover all the bases of things I love. But beyond just enjoying the content I'm creating, there's a lot of scheduling and planning ahead involved. So once we get over the "I do it for the love of it" thing, it really just comes down to content scheduling. I keep a very extensive Google Calendar system that has a bunch of different calendars for each of my channels. That way I can schedule what posts are coming up weeks in advance. Plus Google Calendar makes it so simple to just drag and drop content from day to day if I have to switch anything up. It also makes it a lot easier to see what content I'm posting where so I can try and do a coordinating blog post or make sure to write a newsletter or something. Once I know what I want to post about on each channel, I always do bulk filming days. Tuesdays are reserved for filming everything I need for the next week. Sure vlogging happens whenever, but if I haven't started a vlog for the week yet it's nice to have a solid day in mind to begin filming. Editing is the same thing. I'll take a few hours usually on Tuesday night or Wednesday morning to edit everything. Regardless if the video is going up a week later, I get all them made ahead of time. That way I can upload them and schedule them to go live so if other things pop up during the week, I won't forget to post. It's super important to finish the project rather than leaving it half done with the hopeful dream of getting it done later. If I'm having a particularly busy week, I allow myself to take a break with one or more channels. It's completely ok not to post content consistently all the time. I don't recommend posting once a month, but taking a day or two off if things get hectic is completely fine. If you take the time to plan ahead and really think about content and filming times, YouTube is a lot less daunting to tackle. 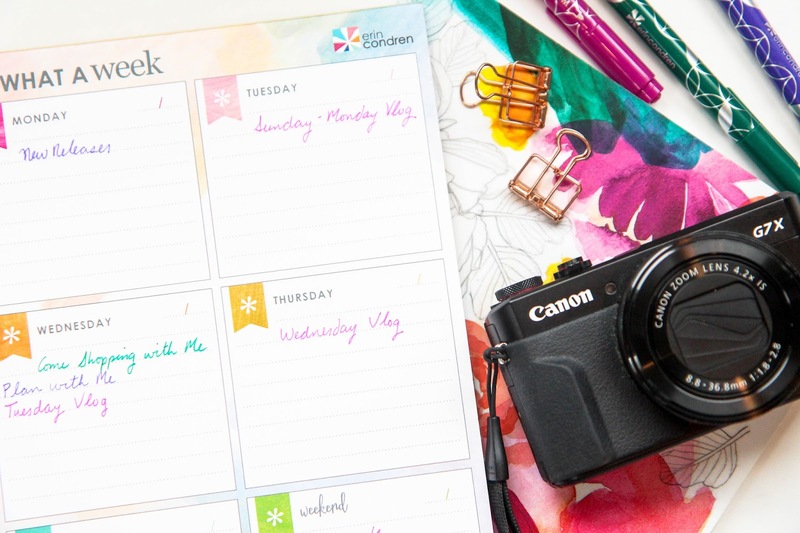 So grab that planner that's close by and get to content scheduling. I can't wait to see what videos you come up with so leave links to your channels below!